This week was pretty slow as the red springs seem to have all gone up the Fraser and we haven’t had a decisive push of white springs show up yet. This resulted in some spotty fishing this past week off the Bell Buoy, North Arm, T-10, and South Arm. There were some fish caught at all of these spots but you had to have lady luck on your side and be at the right place at the right time and the bite was often very short as there simply was not a lot of fish around. We usually get a good push of these larger white springs right about now, so we will see how the coming week shapes up. 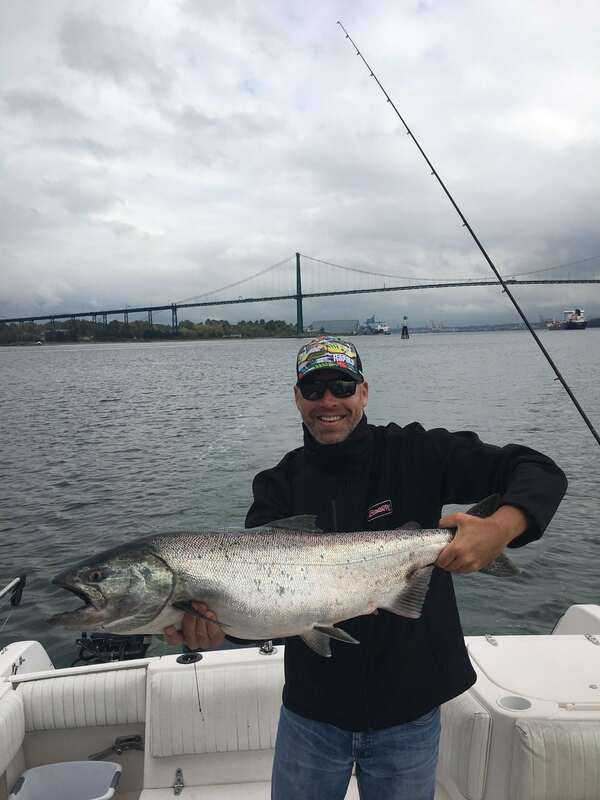 Also expect to see some more coho around as some of the coho destined for the Chilliwack River show up off the Fraser this time of year as well. The Capilano mouth has a few fish now as well. Pretty much right on time we are seeing some of these Capilano white springs show up on the flood tide. Fishing is hit and miss but there have been a few decent flood tides followed by a few slow ones. 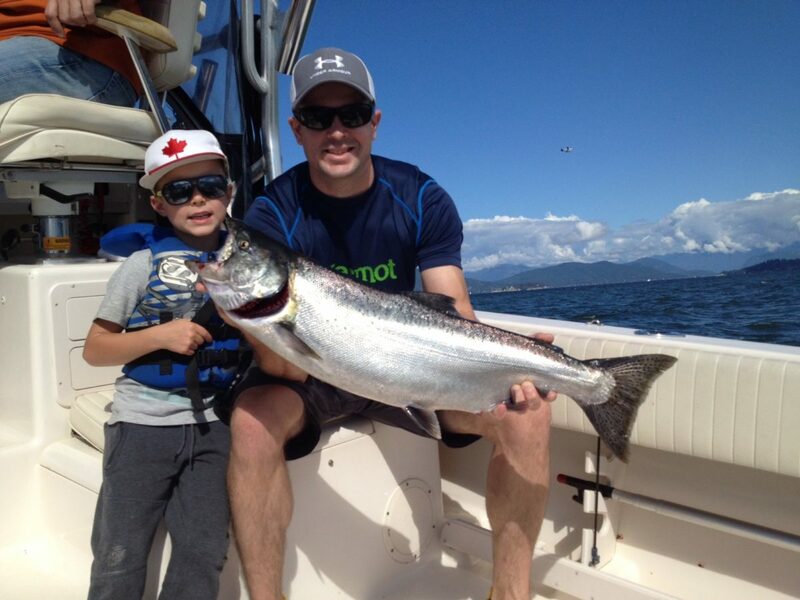 Just like the Fraser white springs, we usually get a decent push of fish this coming week to the Capilano mouth. Remember to keep clear of the freighters and cruise ships as the blue Harbour Patrol boat has been out there pushing people close to the beach and west of the green marker when the big ships are coming through. Also remember that starboard rod has the right of way when you are fishing here. Think of this fishery as a big oval race track. As you are heading towards the Lions Gate Bridge, stay to the outside of the pack of boats, out in the deeper water, then as you get close to the green marker turn in towards shore, so you will be turning to your port side, complete your turn and then troll away from the bridge, into the flood tide current, and you will be on the inside of the tack. Once you get up to Ambleside most anglers will do a turn in that area to the port again, out to the deep water, then head back down towards the bridge on the outside of the pack of boats, then repeat. This keeps this crowded fishery a little more civil. What you don’t want to do is try and come down with the flood tide current, towards Lions Gate Bridge, on the inside of the pack of boats. That causes a lot of problems and you are going to get some verbal abuse if you do that. As most of you know, the name of the game with this fishery is bait and keep it close to the bottom. Jason did some after work fishing off the cap last week and got this nice spring. The Salmon are coming and with them our Fall Salmon Sale! Next Friday through Sunday you will be able to outfit yourself for fall fishing with some amazing in store deals. If you’re on Facebook or Instagram don’t miss out on our great pre-sale giveaway. The giveaway is your chance to win a custom 3106 Sage Trigger rod OR a New Sage Pulse 890-4 Fly rod. All you have to do is ‘like’ our Pacific Angler Facebook and Istagram pages and share the post about the giveaway and you are entered. It’s really that easy! More details about next week’s Fall Salmon Sale are in the sale section of this week’s report. Good luck and see you next week at the sale! The Fall Salmon Sale is officially ONE WEEK AWAY! Be sure to save some time next weekend to visit the shop to stock up for all of your fall fishing needs. There will be amazing deals in every department. Friday Fishing Report subscribers will be the first to receive the full sale list in their inbox on September 14. If you’re reading this on our blog and would like the full sale list sent directly to you be sure to sign up for the weekly report here.